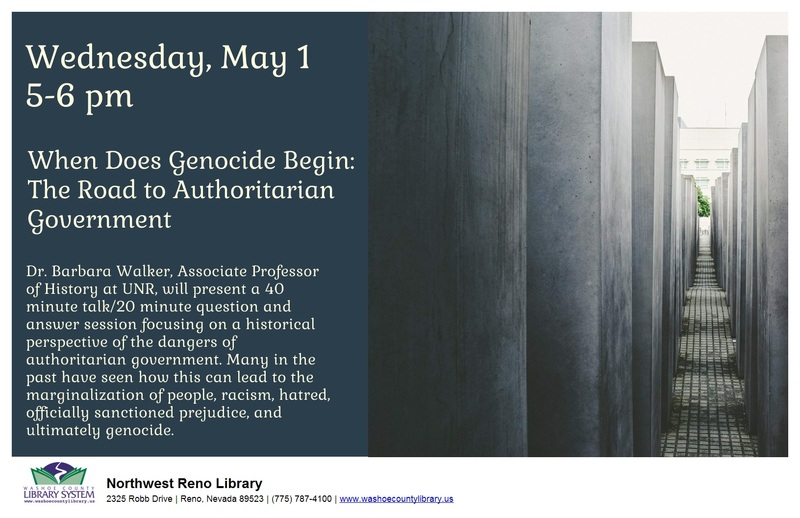 Dr. Barbara Walker, Associate Professor of History at UNR, will present a 40-minute talk with a 20-minute question and answer session focusing on a historical perspective of the dangers of Authoritarian government (see flyer below). Many in the past have seen how this can lead to the marginalization of people, racism, hatred, officially sanctioned prejudice, and ultimately genocide. This program is brought to us by the Governor’s Council on Education Relating to the Holocaust, together with the Reno-Northwest Library. Despite the hope of “Never Again,” ignorance about the Holocaust abounds and Antisemitism is on the rise. This year’s Day of Remembrance program will honor the past and explore the current threats to our nation and the world. The Governor’s Council on Education Relating to the Holocaust, together with OLLI (The Osher Life-Long Learning Institute of Reno) will present a program about the Holocaust at the Atlantis Hotel. Thanks to the generosity of John Farahi of the Atlantis, we will have use of their Grand Ballroom. Holocaust survivor and Reno resident Mitka Kalinsky will be the keynote speaker. The program will also deal with the rise of anti-Semitism in the US and the world. Guest presenters: Mitka Kalinski (Holocaust Survivor), Dennis Dworkin, Jordan Roper, and Van Vinikow. See flyer below for complete presenter details. This free event is open to the public. Limited seating. Sponsored by: Governor’s Council on Education Relating to the Holocaust, Holocaust Survivors Group of Southern Nevada, Board of Rabbis of Southern Nevada, Jewish Nevada, Israeli American Council, and Reno Jewish Community. « Reno Jewish Story Club Meeting	» Seder? Say yes!